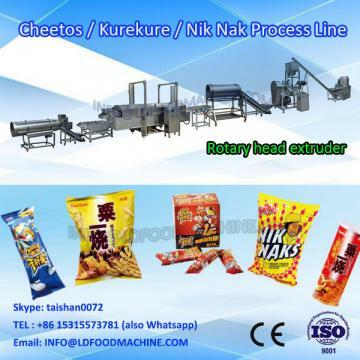 Kurkure/ Cheetos are special extruded snacks, very crunchy and great in taste. They are made by a special extrusion process. The corn grits is moisturized in the flour mixer with water and fed to the Rotary Head Extruder. In the extruder, due to the two rotary plates made of yellow brass, the corn grits are squeezed and twisted to form curls shape. The curls pass through the die and gets cut by the cutting knifes into required lengths. 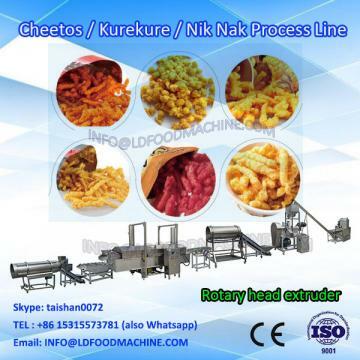 The Kurkure/ Cheetos are fried in cooking oil or toasted in oven and then cooled before flavoring. Seasoning is sprayed on the surface to improve their taste. 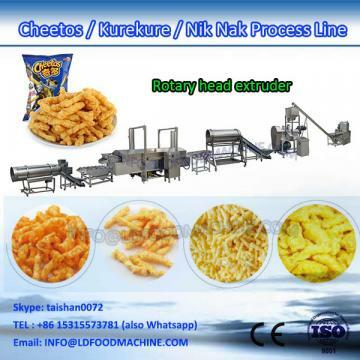 MT Machinery Co., Ltd.'s products include double screw, single-screw extrusion machine, automatic continuous frying pot,snack foods, pet food production line production line,bugles crescent fish salad production line, nutrition Rice noodles, fried noodles production line production line,spiral shell production line, the dog biting rubber-production line, breakfast cereals, maize production line,tissue protein production line, regenerated rice production equipment, small instant noodles production line. With the industry's senior talent and technology advantages of the elite, and the "pragmatic, innovative, enterprising, honest" business philosophy, "serious, active, rigorous, efficient"style of doing things, to provide high-quality products to customers. Company with strong technical strength, high-quality products, reasonable price, perfect after sale-service, is willing to sincerely cooperate with you, create a better future.